I specifically wanted a 12v sensor so as not to load down the already over taxed 5v rail on the RAMPS. 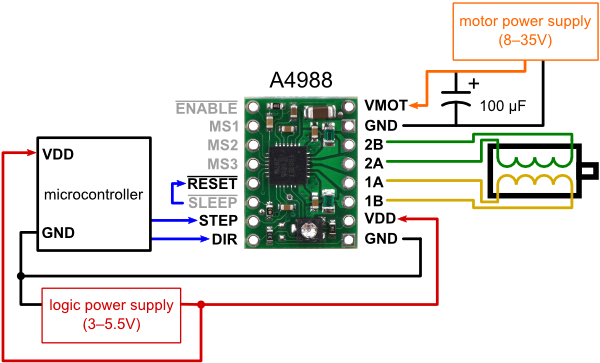 The main issue is that this sensor has a 12v output and the mega IO pins are 5v input max. Commonly other have used a 10k and a 15k resistors as a voltage divider so that the output is 5v. This did not work on my sensor, the result was more like 3v. Which is not high enough to count as a logic high. My sensor seems weird.. I needed to tweak the values. Second issue, Power. I didn’t want to run separate power from the supply. The 2 pin 12v ramps connector is already used for hotend fan and I didn’t want to tap into that. I wanted a solution I could just plug in. I'm going to use the E1 socket for power and signals. Note the E1 motor connecter is directly plugged into the inductive sensor and the endstop IO line. The circuit is still just a simple voltage divider, but using a variable resistor so the output voltage can to tuned. On the right hand side you see the first 2 pins are VMOT and GND. That is 12v power, and I will use that for the probe. The next 4 pins are the 4 stepper motor pins. On the ramps these only go to the stepper plug, so can be reused. I redefined them as +12v, gnd, signal_raw and signal_ttl. Cut out a piece of vero 7*4 holes in the following orientation. Ignore the nick out of the side and the top, these are not deliberate. The top line will plug into the pololu socket, top left is column 1, row 1 for the following notes. Add in the power wires. This is the underside. So column 1 is at the right. Next add in the 6 connecting pins. All going well you can now just plug the adaptor into the E1 socket. Now all you need to do is wire up signal_ttl to your Endstop signal line. in the first result image above this is the green wire from the Z min endstop signal line to the 4th pin of what used to be the motor connector. Objective achieved. A plug in play solution for a 12v NPN Proximity Sensor that doesn’t involve splicing cables for power, or nasty cables with inline resistor divider circuits.